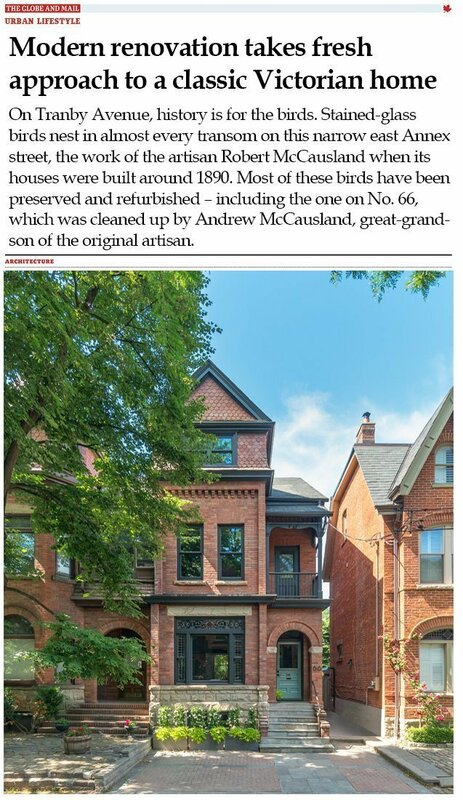 Modern renovation takes fresh approach to a classic Victorian home | Williamson Williamson Inc.
“On Tranby Avenue, history is for the birds. Stained-glass birds nest in almost every transom on this narrow east Annex street, the work of the artisan Robert McCausland when its houses were built around 1890. Most of these birds have been preserved and refurbished – including the one on No. 66, which was cleaned up by Andrew McCausland, great-grandson of the original artisan. Alex Bozikovic praises our collaboration with 3GEN and Geronimo in his latest Globe and Mail article seen here.